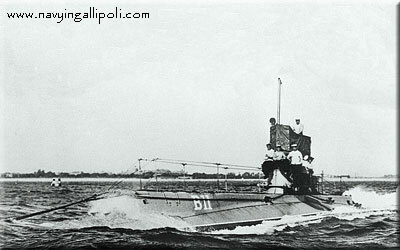 Instruction of the Ottoman Inspectorate of Sea Mines and Costal Fortifications, released on January 31, 1915 and concerning the means of observation and fighting against submarines. A perfect prove that some Turkish soldiers put the instruction quoted above into practice - the E7’s periscope hit by a small artillery shell. 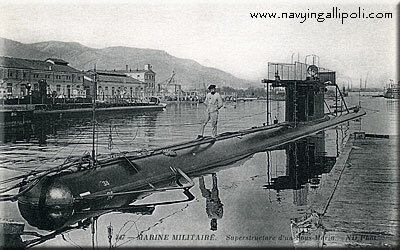 Emeraude (on the picture) gave the name for the whole class of French submarines. 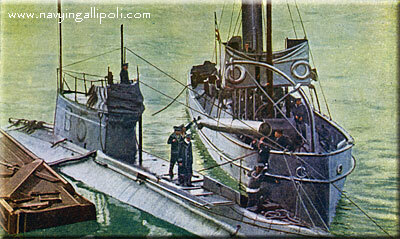 One of her sister ships, Saphir, sunk in the Dardanelles on January 15, 1915. 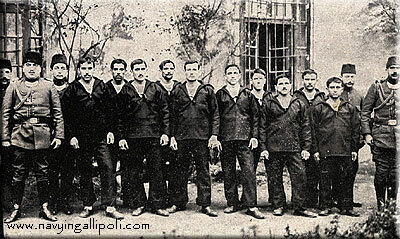 The crew of French submarine Saphir (lost on January 15, 1915) in Turkish captivity. 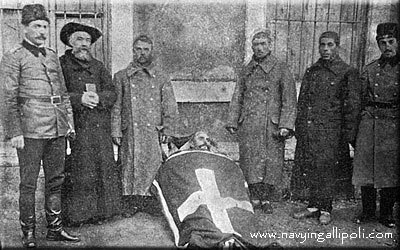 The funeral of Saphir's chief Bône was used by the Ottoman propaganda. The ceremony was done by the Greek pope and three members of the crew were present. 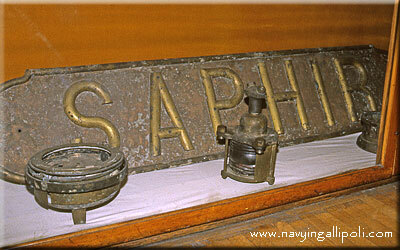 A plate and some other objects from Saphir exposed in Naval Museum in Beşiktaş, Istanbul. 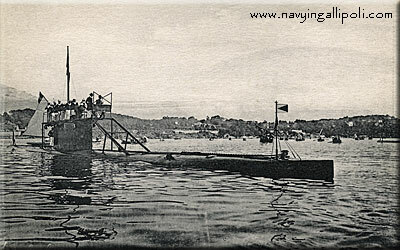 Another submarine of “Emeraude” class lost by the French in the Dardanelles was Turquoise. 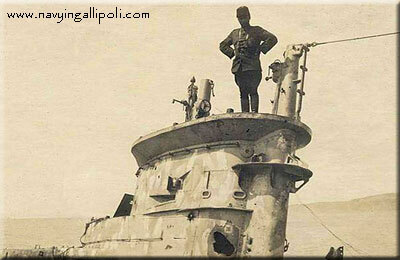 She was captured by the Turks on October 30, 1915 and renamed as Müstecip Onbaşı. 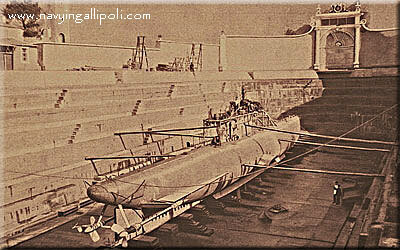 Turquoise in the dry dock at Golden Horn in Istanbul, shortly after she was captured. 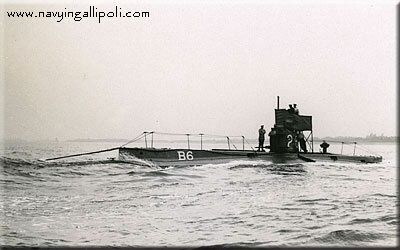 E15 soon after she grounded near Cape Kepez on April 17, 1915. 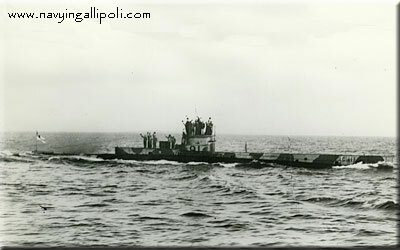 E15’s conning tower soon after she grounded near Cape Kepez on April 17, 1915. Note the hole made by a 15 mm shell from Dardanos Battery. E15 soon after she grounded near Cape Kepez on April 17, 1915. The arrow shows the hit scored by Dardanos Battery. 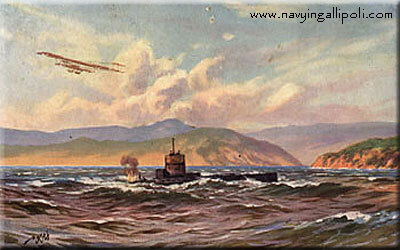 This hit has killed the submarine’s commander Lt. Comdr. 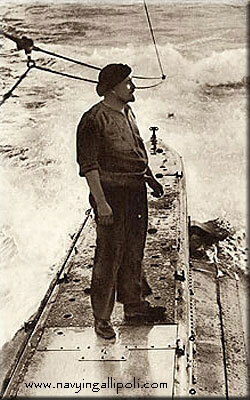 Theodore Stuart Brodie and made the ship’s return to deep waters impossible. The officer in fez taking notes (to the right) is the German commander of Fort Anadolu Hamidiye Cpt. Fritz Wossidlo. E11 returning from the mission to Constantinople. 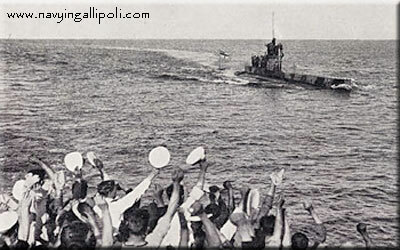 Remains of one of two torpedoes which fired by E11 at Turkish tug Kısmet missed the target and exploded on the shore. 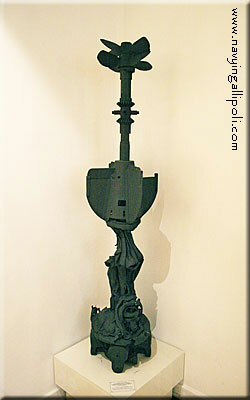 Now exposed in Naval Museum in Beşiktaş, Istanbul. 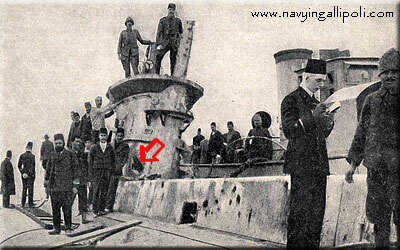 Remains of the other torpedo which fired by E11 at Turkish tug Kısmet missed the target and exploded on the shore. 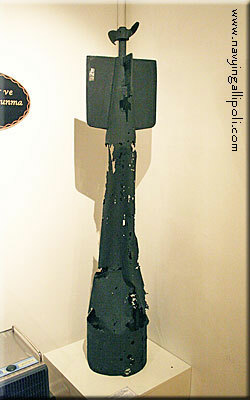 Now exposed in Naval Museum in Beşiktaş, Istanbul. The commander of the AE2, Lt. Cdr. 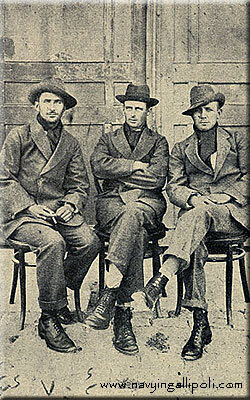 H. H. G. D. Stoker (to the right) and two other officers in captivity. 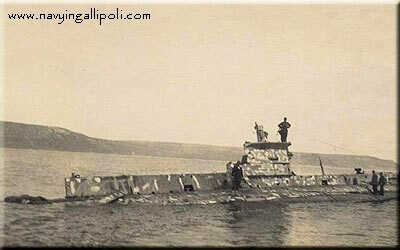 A British submarine attacked by an Ottoman plane on the Marmara Sea, near Bolayir.